Submitted by Aspire on Wed, 11/10/2010 - 17:03. As the holidays descend upon us all, Cleveland-based Aspire Auctions offers lovers of decorative and fine art a chance to enjoy the giving spirit of the season with its 2010 November auction. Lots will be available for preview November 12 - 17th (but closed on Sunday). Bidding opens this Friday Nov. 12th starting at 10am. Aspire will have a preview party that evening from 5-8 pm complete with champagne and hors d'oeuvres. Lots close over a three day period: November 18th, 19th and 20th. One of this auction’s flagship pieces is a portrait of Mao Tse-tung dating back to 1972 but purchased from Allstate Art Galleries in 1987. Still in its frame, this vividly colored silkscreen measures approximately 35-7/8" x 35-7/8" in size. 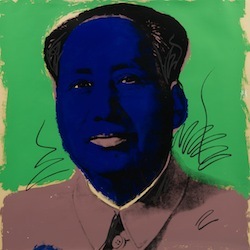 Warhol, whose work often explores the commodifying effect of fame, “understood that while Mao’s actual political influence was fading, he was still an ‘icon’ ready to have his reputation sanitized and transformed into a subject for a capitalist art audience”, wrote the Huffington Post. About these pieces, the New York Times wrote, “Bidders are likely to include not just the wealthy American hedge fund managers who have been spending huge sums of money on "wall power," but also China's new rich, who have also begun snapping up contemporary art. For those Chinese bidders, a historic portrait of Mao would be considered the linchpin of any collection.” Given such a breadth of potential bidders, this Warhol work will surely move quickly. Another 20th Century American artist of note--though often overlooked -- is Romare Bearden, whose piece “Yellow Bird” is lot 141. This work is a watercolor on paper signed in pencil at the upper left, matted and framed under glass in a gilt frame overall apprx. 13" x 13". A consummate Renaissance man, Bearden was not only also a jazz musician (with a song recorded by Billy Eckstine), a caseworker for the New York Department of Human Resources for decades, but also an visual artist who studied Moderism in Paris who also frequently depicted Harlem street scenes and other facets of the urban African-American experience. Aspire’s lots also reflect a history of art that’s been diminshed over time, due to possibly controversial reasons. This auction features a charcoal-on-paper work by Italian artist Mario Sironi, whose images shaped the political myths of Italian Fascism and earned the approval of Mussolini. “PNF” (Partito Nazionale Fascista) is approximately 6-3/4" x 5" sans frame; it possesses a collector’s stamp at the lower right corner from the Casa del Fascio of Ferrara, which served as a headquarters for members of the Fascist party in the northern Italian city of Ferrara. In addition to several Sironi pieces (lots 107 - 109), Aspire also offers less politicized Italian works; namely, a lovely collection of fine art glass. One example is Pino Signoretto’s horsehead vase (lot 211), a luminous green glass vase designed after an archaic Roman form of a horse head poised on a circular base. This monumental vase stands approximately 22-1/2"H x 8-3/4" in diameter. The Murano-based Signoretto has worked with artists such as Dali, Vercruysse, and Koons; he’s also been shown at the Tohama School of Glass and the New York Experimental Glass Workshop. Balancing out Aspire’s bounty of Western art is an extensive collection of netsuke (Often prounced "net-ski", while the actual Japanese is closer to "netskeh"). Netsuke are small sculptural objects, or toggle, usually worn to suspend objects hung from the sash of a kimono. Depicting everything from adorable animals to charming little travellers, these diminuitive delights’ bid prices start as low as $75. Complementing this netsuke collection are Asian ivory and horn carvings that range in size and characterization. One of Aspire’s prouder finds, however, is a bronze shishi incense burner from 19th century Japan. In this piece, a small incense chamber rests within the head of a shishi (lion-dogs) who frolicks with two others just like it. Special to this November auction are a single owner collection of parasol and cane handles, which dovetail quite nicely with Aspire’s collection of jewelry, such as a signed Cartier diamond spray brooch (lot 621). The cane and parasol handles range in design from Victorian to Art Deco; yet they all demonstrate a sharply elegant classiness.